Since the 4th century, the Christian church has held that Jesus Christ—the second person of the Trinity—was one person of two natures—fully God and fully human. What the church has never explained, and still cannot explain, is how that came to be. The reason the Catholic church and the Evangelical church has got away with this unaddressed question is that it really doesn’t matter as long as the expression of God in humanity is restricted to Jesus. No one cares as long as it was a one-time event, a miraculous occurrence that we can safely ignore. Orthodox Christianity has no answer, except that Mary is the mother of God. While the nativity stories are warm and inspiring, they really don’t provide an adequate answer. And the reason orthodox Christianity has no answer is because the whole idea of an Incarnation of God in Christ is really something that came out of metaphysical ideas from the Greek culture in which Christian theology evolved. When Paul wrote, “Christ in you, your hope of glory” he was speaking to gentile (Greek) Christians whose worldview was Stoic and Platonic. He was describing what western culture calls Truth—the belief that there is a world of unchanging, eternal Reality from which all things are expressed. So if we want to know how it is so that there is a Christ in me, we must look to Christian Metaphysics, not Christian Theology, for the answer. And that is what we have in this text. This text is “The Mode of the Incarnation” from W.L. 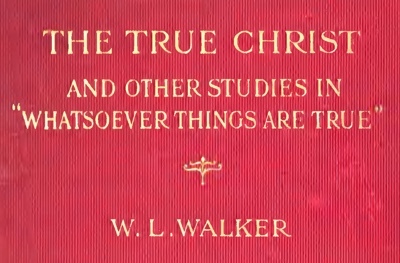 Walker’s 1910 book The True Christ and Other Studies in “Whatsoever Things Are True.” It is a book, not of Catholic Christian theology, nor Evangelical Christian theology, but rather of Metaphysical Christian theology. It’s author does exactly what Jesus, Paul, John, Augustine, Eckhart, Erasmus, Emerson and Fillmore did—convey the eternal Truths of Christian theology using concepts taken from Greek metaphysics. Rather than comment on the following text, I have placed highlighting in places that seem to be especially insightful, at least to me. I hope they help explain why it is that Christ in you is your hope of glory. If we view the Incarnation in this way it will enable us also to understand how it was accomplished. It was the complete indwelling and possession of a human spirit by God in His ethical and spiritual truth—God thus finding as complete expression for Himself as it was possible to find in a human form, and thus constituting Jesus His unique (while truly human) and perfect Son. There was, therefore, as truly a completely Divine as there was a completely human side to the personality of Jesus. In order to see this we do not need to try to think of a Divine Being stepping out of His Divine Life at a definite moment of time, contracting Himself to the dimensions of a rudimentary human being, or in some way imparting so much, as it were, of Himself thereto. This is a form of belief which many profess to hold, and which they regard as the only “orthodox” belief, or the only theory that can give us the Divine Christ or an actual incarnation of God in Jesus. But it may be seriously questioned whether there are many to whom it is a real, vital truth. It is certain that many find it exceedingly difficult or impossible to believe in such an incarnation; it is not a help to them, but a hindrance standing between them and a real, vital belief in Christ and the Gospel. Nor is it possible in this way to have the incarnation of a pre-existent ethical Being such as we must have for a real incarnation of God. An ethical Being can only be ethically imparted, and this can only be accomplished by a gradual spiritual process. But such conceptions as we have mentioned are wholly unnecessary in order to see the real incarnation of God in Christ. It is true that we must not only see God in Christ by His spiritual indwelling, but must also account for the Personality that can be so completely receptive of God, and in which God can be so fully present as to be able to express Himself in human form. But God did not then enter the world of man’s life for the first time. As the prologue to the Fourth Gospel teaches, “The Divine Word” that became flesh in Christ was in the world before this, its highest expression. We see in Christ no mere product of creation, but the culmination of the gradual self-communication of God to men to which the whole Old Testament is witness. In Christ we have the consummation of a gradual, ever-growing incarnation of God in man, which, as the result of an ever-increasing immanence in man through the Spirit, reached its culmination in the birth and life of Jesus Christ. Modern thought should have no difficulty in realising this. We believe in evolution; but why should evolution stop short at the lower, “natural” man and not go on till the higher, spiritual and Divine man is reached? And, if God is deepest of all in the world’s life, must He not become manifest when the human, the highest life in the world, appears in its truth, just, as truly as that which was latent in the seed becomes manifest in the flower? When once “nature” was transcended by man as a spiritual being, new spiritual influences began to operate, and we witness their result in the birth and life of Jesus Christ. As in natural evolution, we are unable to trace the working of the formative forces right on to the new appearance; but that new appearance is none the less their outcome. And, although in Israel there was general religious decadence when Jesus appeared, yet there was always a line of the humble pious wherein God was working, and it was from amongst those that Jesus came, as He in whom God found complete spiritual entrance into our humanity. I believe that it was towards this very end of His self-communication to and self-expression in man that God was working from the beginning of the creation; that this was the very ideal and purpose of the creation; that it was in Israel that He found the chief line of advance therein; that this was the deepest meaning of the religious movement in this ‘people, which also took up into itself elements from the Divine movement in other peoples; that the results were handed on in the same way as those of all forms of development have been handed on, that the whole movement culminated in the birth of that organism which formed the ground of that Divine-human life in Jesus Christ which was consummated by His complete sacrifice of Himself in the name of Divine Righteousness and Love. It is only, I repeat, by a gradual entrance into humanity, not by a sudden entrance, or by a birth in one individual in one moment of time, that an ethical Being can find self-expression therein. There must be an ethical preparation for the incarnation, organically expressed. In this way we see not only God in man, but God as man. We have the incarnation of God in Christ as the result of the orderly and continuous movement of God in human history, as the natural culmination of the creation, indeed; that in which its Divine ideal and deepest power become manifest. It is the Divine self-realisation in this human world. On the other theory God seems to have been absent from the world, or doing nothing effective for His self-expression therein.